Once you log in you are displayed with the initial page of the environment. Quick access to your courses and your personal information settings. 1) Courses – find all the courses to which you are registered at the moment (the same can be seen by clicking the Courses tab at the initial page). Keep in mind: Students are enrolled in their Bb courses after the end of online late registration and at the latest by the first day of classes. If you cannot see your course for any reason, notify your Professor. He/she will make sure that you are enrolled in the Blackboard course or that the course is on and available for the students to see. 2) Settings – find links that allows you to make changes according to your preferences (see Settings table). Help – supports you with help in Blackboard through manuals, tutorials and more. C. Log out: The Log out button is located at the upper right corner of your page. It logs you out of the Blackboard platform and closes your page in the Blackboard server. Always remember to LOG OUT when you finish, in order to deactivate your account. D. Quick Links – It gives you an outline of the page you currently are. By clicking the icon, a pop-up window opens that displays all of the page landmarks and headings, allowing you to select one and jump directly to that location within the page. Any available keyboard shortcuts for the page are also displayed. Consists of three default panels: Tools (A), My Announcements (B) and My Courses (C). Select the Modules you would like to appear in My Institution tab by clicking the Add Module button (D) and checking the corresponding boxes. Personalize your page from the Personalize Page button (E), (always remember to click Submit for applying your changes). Alter the order of the boxes with the Keyboard Accessible Reordering: Modules button (F), according to your preferences. 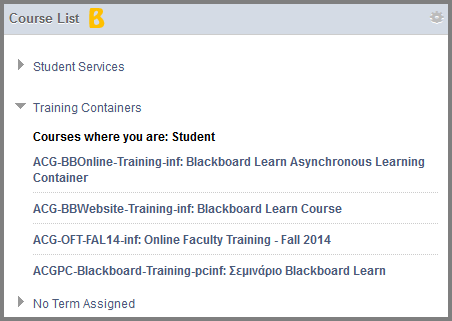 You are able to group your courses by managing the My Courses (via My Institution tab) and Course List (via Courses tab) modules by using Terms. A term is mainly a label with a date range which will be used to define ACG’s semesters, terms, sessions, e.t.c. It will also be associated with Academic Societies and Student Services. The Terms are used for organization and classification purposes. Log in to Blackboard Learn. Visit the My Courses module in the My Institution tab and/or the Course List module of the Courses tab. 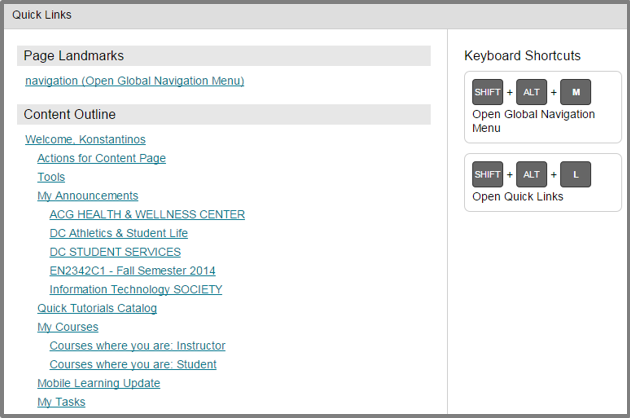 Click the Manage My Courses Module Settings. Check the Group by Term check box. 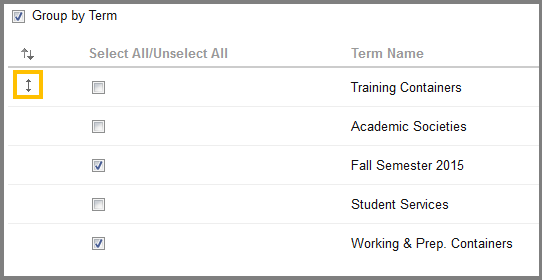 After you successfully group your courses, you can reorder them in any way you want. Click on the gear button at the top-right of the My Courses module. 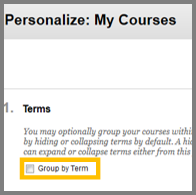 While inside the Personalize: My Courses page, drag the double-headed arrow with your cursor in order to rearrange your Groups. After you finish, click the Submit button. To view the contents of a term i.e. 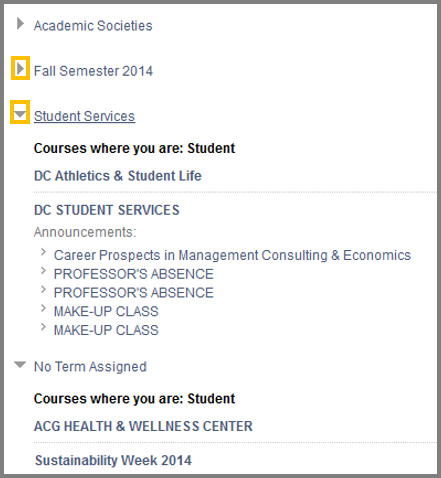 Fall Semester 2014, you will click the arrow so as to expand or collapse its contents. My Courses – displays a list of the courses that you are enrolled at the moment and through it you can access each course page. The same can be done by the Courses tab. A. Course Search – type the name of the course you are looking for and click Go. B. Course List – look for your course and click its name so as to open it.